Don't yet have plans for New Year's Eve in Buffalo? Don't sweat it. Here are the top parties going on for every type of evening. From family-friendly fun to black tie attire, here are the best-of-the-best parties going on in the city this New Year's Eve. 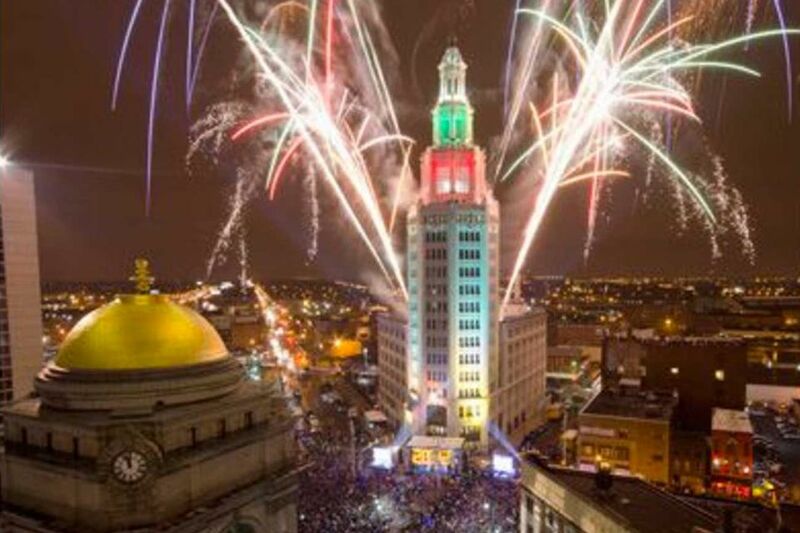 Up to 40,000 spectators are expected to brave the cold this year to celebrate the New Year at the ball drop from Buffalo's Electric Tower, making it the second largest event in the state next to New York City. The show will be followed by an impressive fireworks display. For a night of elegant celebrations with dinner, dancing and formal attire, the Ice Ball at Statler City is just up your alley. Split between six elaborately decorated banquet rooms at the immaculately restored building, guests will have the option to listen to different bands as they dine among friends. Not all New Year's Eve events have to be geared towards adults, the kids should be able to have some fun too. That's why every year​​ First Night puts on a family-friendly event from 5 pm to 10 pm with bounce houses, carnival rides, animals, trampolinists and illusionists, to name a few. Do you want to see the ball drop but don't want to brave the cold? Then the party at Big Ditch Brewing Company is the perfect solution. Ring in the New Year with craft beer, a DJ and food, all with an unobstructed view of the Electric Tower ball drop and fireworks show. Just off the beaten path, the New Year's Eve party at Templeton Landing allows guests to celebrate the evening in the midst of the city's stunning harbor. Enjoy passed hors-d'oeuvres, a five-hour open bar, a dinner buffet and desserts, all culminating with a champagne toast at midnight. Resurgence Brewing Company hosts a New Year's Eve party with food, open bar with cocktails, music, games and a Polaroid photo booth. There's also a champagne toast at midnight and a beer release to ring in the new year. Note: Resurgence did not hold a NYE party in 2018. Local breweries are stepping it up this year and Rusty Nickel Brewing Company is no exception. Each year the brewhouse hosts a themed bash with music, games, food and their famous keg drop. Don't worry about missing out if you're the designated driver for the night as there will be craft sodas on hand. It may be a short drive from Buffalo but the New Year's Eve celebrations at the Hard Rock Cafe in Niagara Falls can't be missed. Each year the Hard Rock Cafe drops a 10-foot tall guitar from the roof of their restaurant to ring in the new year. Anywhere from 15,000 to 20,000 spectators come out to celebrate making it one of the largest celebrations in the state.